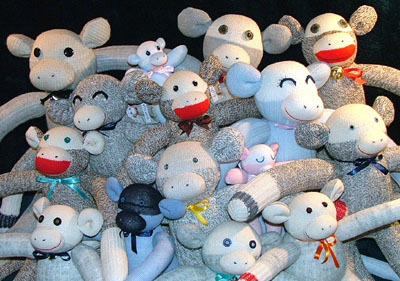 Robin is always making new Sock Monkeys & Sock Animals and they are looking for loving homes! Every one is a unique individual & full of personality! Because everyone is different, often they are created and find new homes faster than we can update the site, so if you’d like to know who is available, contact robin@roroart.com for pictures & details. 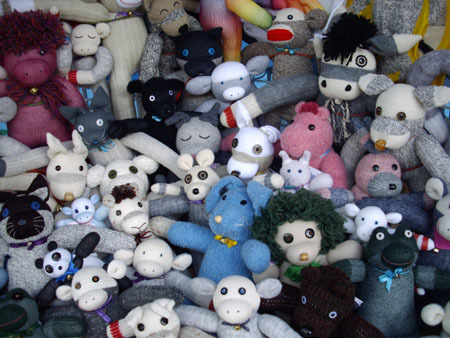 Each unique RoRo Sock Monkey & Sock Animal is hand-made by me (Robin) with great love & care from one pair of Socks & well-stuffed with 100% polyester fill. I use all new materials. All the sewing is re-enforced for strength & durability; button eyes & bells are sewn firmly in place. Some have embroidered faces; to be completely baby safe they have no buttons or bells. My signature is on each and I guarantee the quality of my workmanship. The average price for a traditional full-size Monkey is $70, but the price will vary depending on the type of Animal, sock, size & details. Prices start at $35. 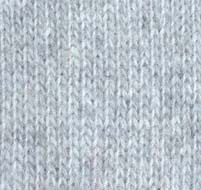 I use every kind of sock, and different types of socks such as wool or cotton, blend or brand will affect the price. The size of the sock determines the size of the Animal, which ranges from about 5 inches tall (baby socks) to 22 inches tall (large men's socks). Price is also affected by the length of time it takes to make an Animal and the details, such as the face, length of the tail, manes, fur & costumes. Some Creatures are well over $100, but $70 is the average. These prices are Canadian dollars, and I have included the HST in the price. Shipping costs are extra. We accept cash in person, cheque & credit card. Please contact me and tell me what sort of Creation you would like! I will write back as soon as I can and tell you which Animals I have currently or what I can make for you. I can make any kind of Animal; custom & personalized orders for Monkeys & Animals are welcome! Note: Some Animals take longer to find the right kind of socks for than others, so the length of time to fill the order, and the price, may vary. Personalization can include colours, embroidery, names & costumes. No deposit is required on a custom order. We will confirm the details. Once the order is completed, only then will payment be processed, and the item will be shipped upon confirmation of the payment. Personal pick-up is welcome at arts & crafts shows (see the Showlist page) or at the Studio (see the Contact page). New! 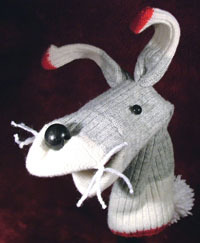 Another fine tradition is the beloved Sock Puppet, a creature brilliant in its simplicity & alive with fun! Please contact me for more information. My Sock Monkeys are the highest quality toys that I can make! They are built for Adventure! Should a Monkey have too much fun in a mud puddle, or a mishap with some hot chocolate, they can have a bath in the washing machine! I recommend using a laundry bag & Creatures with manes or fancy details might need a little extra care – contact me for washing tips. If we are shipping to you, we accept cheque & credit card, and charge shipping according to address (it helps to include your postal code when inquiring). We use Canada Post Xpresspost, which includes a tracking number, but RoRo Art is not responsible for items lost or damaged in shipping. We are happy to ship anywhere in the world, just let us know where! Please note I build these Animals to be as durable as I can, but they are NOT dog toys! If a Sock Animal is hurt by Acts of Dog, you can return the Animal to me and I will repair it, cost depending on the repair. If an Animal has costume or non-fabric details, I will build them to the highest quality standard I can, but they are not recommended for rowdy play. If the Animal is injured by any means, I will repair for a minimal cost & if there is any defect due to manufacture, I will repair for free, but please contact me in a timely fashion. Treat your toys with love, and they will love you forever. Contact robin@roroart.com.